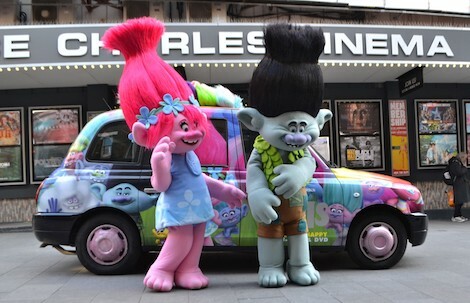 Twentieth Century Fox Home Entertainment UK is celebrating the launch of DreamWorks Animation’s Trolls on DVD, Blu-ray and digital download by transforming an iconic black London taxi and giving passengers the happiest ride in town! Sherbet Media is the advertising division of Sherbet London and the Sherbet London fleet includes over 500 fully licensed black London taxis – described as the capital’s fastest growing fleet of licensed taxis! In a week-long campaign across the capital, commuters, tourists and movie lovers will be literally transported to the colourful, fun-filled world of the Trolls. The campaign features a fully branded taxi including glitter hubcaps, full wrapping, special number plates and multi-coloured hair. The taxi activation was devised by Rapport and 20th Century Fox Home Entertainment UK and delivered by Sherbet Media who specialise in producing high impact, experiential campaign executions on London’s taxi fleets. The taxi can be seen touring several destinations including The London Eye, London Zoo and Leicester Square as well as bringing its unmissable colour and humour to some lucky patrons in the West End. DreamWorks’ Trolls is a fresh, broad comedy filled with music, heart and hair-raising adventures. Featuring original music from Justin Timberlake who also voices the characters along with Anna Kendrick, Russell Brand and James Corden. This entry was posted on Wednesday, February 15th, 2017 at 09:19 @430 and is filed under DailyDOOH Update. You can follow any responses to this entry through the RSS 2.0 feed. You can leave a response, or trackback from your own site.